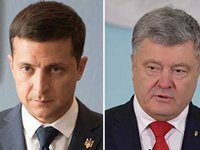 Ukrainian President Petro Poroshenko has said that he is expecting Ukrainian presidential candidate and showman Volodymyr Zelensky to take part in debates prior to the Ukrainian presidential runoff at the Kyiv Olympiysky Stadium on Sunday, April 14. "On April 14, next Sunday, at the Republican Stadium [Olympiysky], exactly where Mr. Zelensky proposed, I am waiting for him to face off in debates," he said on the Ukraina TV Channel on Sunday evening. Poroshenko also said that he wants to undergo a medical test at the World Anti-Doping Agency (WADA) at the beginning of next week, as Ukrainian boxer and ex-world heavyweight champion Wladimir Klitschko has previously proposed that to the presidential candidates. "The leadership and experts of this organization will come here immediately, as Wladimir Klitschko said, at the beginning of next week. And I want to say that I will undergo these tests right upon their arrival," the Ukrainian president said.